Western Pennsylvania ARES will host an emergency communications conference June 14, 2014 from 9AM-5PM at the University of Pittsburgh-Johnstown campus. The conference is free and is open to all amateur radio operators including those outside the Western PA ARRL Section. Hams who wish to attend should please register at http://wpaares.org. Even though there is no cost to attend, we’d like to have an estimate of the headcount. Inexpensive lunches will be available for purchase. For those traveling from a great distance, a limited number of dorm rooms are available. Please contact Harry W3YJ (w3yj@arrl.net) for more info about reserving a room. • Introduction to D-STAR and D-RATS. • Lawrence County ARES Reorganization – would it work in your county? • Amateur Radio at Children’s Hospital of Pittsburgh of UPMC. • Hands-on workshops on D-STAR, D-RATS, and BBHN. Please go to the website of Western PA ARES (http://wpaares.org) for a map, updates, and registration information. Please contact Western PA ARES Section Emergency Coordinator Harry Bloomberg W3YJ via email at w3yj@arrl.net for more information. On Saturday, October 5, the ARRL will be holding it’s annual Simulated Emergency Test (SET) drill from 9am-noon. From the ARRL website – The ARRL Simulated Emergency Test is a nationwide exercise in emergency communications, administered by ARRL Emergency Coordinators and Net Managers. Both ARES and the National Traffic System (NTS) are involved. The SET weekend gives communicators the opportunity to focus on the emergency communications capability within their community while interacting with NTS nets. Our county-wide scenario will be that a large tornado has moved through the county. It has disrupted communications and has caused widespread injuries throughout the county. Our Section Emergency Coordinator, Harry Bloomberg, W3YJ has set some specific guidelines for each county and we are going to follow those to the best of our ability. We will need to have at least one operator and possibly two at each hospital in the county to man the 2 meter station at each facility. We will test our ability to pass traffic to one another utilizing the W3LIF repeater and simplex. We will also have the EMA station on the air as well and most net control will probably take place at that location. I anticipate a “call-out” over the air via the 145.35 W3LIF repeater system on Saturday morning. This would be just as we would have it in a real situation. We will first set up a SKYWARN net and begin taking simulated damage reports. Through these reports, it will become apparent that a large tornado has affected much of the county. Shortly thereafter, we will be asked by the Red Cross to send operators to each of the shelters that they are going to be setting up at local high schools. We will need operators to go to each of those locations. Hospitals will be sending simulated health and welfare traffic to net control to indicate how many patients have arrived, etc. We will also send simulated health and welfare traffic between net control and the Red Cross shelters at the high schools. It is likely that we will need to use 2 different repeaters and there may even be a surprise thrown in – hint – just be prepared to operate simplex if needed! A reminder – There are many, many folks who listen to us on the air. There may also be many folks around during the SET drill observing what we are doing. We must act and conduct ourselves professionally at all times. In a real emergency, our served agencies will be looking to us to help and if they don’t think that we can handle the job in a professional and efficient manner, they will not ask for it in the future. Remember, our job is to serve and help them. One final point that I’d like to emphasize – If you can, please get out to these locations and operate portable as closely as you would in a real situation. Obviously, this is a simulation, but if you are asked to go to a Red Cross shelter or some other location, please try to be available to actually do that as it will be a better test of our actual preparedness. It is not likely that you will be able to get into the schools and actually set up a portable station, but getting to the parking lot and operating mobile or portable (even better) will give us a good idea of how well our equipment works in those situations. Why not test out how well your handheld will do? It may be all you have in an emergency! So please plan ahead! Make sure your batteries are charged and you have backups. Get your “go-kit” together and prepare! I’m looking forward to a great drill! If you plan to participate (or if you have any questions), please email me at w3sax@arrl.net so that I can plan accordingly! For more information and tips, check out http://www.arrl.org/ares. Hope to hear you on Oct. 5! Hello Fellow Amateurs and ARES volunteers! We have a training opportunity coming up on Saturday morning, Sept. 28 in downtown Sharon. Penn State Shenango will be hosting a 5K race to be run downtown near the campus that morning. They have asked for volunteers to help with radio communications that day. Our main job would be to be posted on the course and keep an eye out for runners and their status. If we have enough volunteers, we may possibly shadow race officials and provide any communications they may need as well. We anticipate running a simplex next, so a handheld would be needed. The time required would be from about 8am to 10am that day at the latest. Please reply to w3sax@arrl.net if you are interested and available to help out! We would like to get an accurate count of who will be there by early next week. Thanks! te goal of our SKYWARN net should be to provide the most effective and efficient net possible in Mercer County. To that end, here are some reminders when acting as a spotter and checking into a severe weather net. 1. DO follow all instructions of the Net Control Station. 2. DO monitor the net frequency (W3LIF repeater) for important information. 3. DO check into the net if you observe severe weather in your area. 4. DO make your report using the Time-Effect-Location (TEL) format. Keep reports as brief as possible! 5. DO take SKYWARN training and obtain a spotter card. 6. DO act professionally at all times. You never know who may be listening, and we want to portray our ham radio organization as a professional public service to our community. 7. DON’T report cloudy skies or light rain at your location. Remember – the weather in various parts of the county will vary. If you are not observing any of the criteria for reporting below, please do not make a report. 8. DON’T check in or transmit during a tornado warning or when the net is operating under Condition Red unless you have IMPORTANT information. 9. DON’T rebroadcast any information that you hear over a scanner, television, the internet, or radio. Often, these reports can be misleading and inaccurate. Only report events that you actually observe. 10. DON’T answer any calls from the National Weather Service on the repeater, unless you are a net control station and are authorized to do so. 11. DO make sure you and your family are safe in the event of severe weather before performing any SKYWARN duties. If you choose to operate mobile during severe weather, please use the utmost caution. Tune to the W3LIF repeater, where SKYWARN nets are held. LISTEN FIRST! Before you transmit, listen for a few minutes to see if a net is already in progress. Others may have begun to activate the net. If you are hearing reports on the repeater that meet the criteria set by the NWS. Please note: The need for activation occurs when only one of these criteria are met. EVENT – HAIL, TORNADO, FUNNEL CLOUD, ETC. Often severe storms strike quickly and are isolated in our area. There will be times when there is no radio operator at the NWS to make direct contacts to you. This is when your main link to the NWS is via the 800 Severe Weather Hotline. One person, often the Net Control Station, should be delegated to using the HOTLINE to relay severe weather reports. This will avoid duplication and keep the 800 lines free. Whenever calling the Severe Weather Hotline identify yourself as a SKYWARN member in Mercer County. The radio operator at the NWS and your net control station can provide information on the current watch/warning status for your county and a brief radar synopsis. It is up to the net control operator to determine what level of net activation is required given certain circumstances. The degree needed varies, but could be effectively arranged in a four-tier system. When used: When a Severe Thunderstorm Watch has been issued, but no weather activity is occurring in the area. Note the expiration time of the watch. A net control station will then be established and take and log check-ins. Now is the best time to establish where potential observers are located for the upcoming event, not when the severe weather is hitting. The net control station will also relay watch information frequently. Normal use of the repeater will continue, however, please leave a pause between transmissions should net control need to break in to take the net to a higher level. You will possibly hear the “weather alert” on the repeater. As the storms approach your area, the net may need to be fully activated. There are three levels of full activation. When used: Used during ALL Tornado Watches and during Severe Thunderstorm Watches when active weather is occurring. Nets for Flood/Flash Flood Watches are normally not required. There may be exceptions when the NWS would request additional spotter reports, ex. remnants of a tropical storm moving through the area. The first priority, during condition green, would be taking and relaying weather reports to the NWS. Second would be check-ins. The Net Control Station takes control of frequency and gives frequent updates on net status and weather watches. Prepare for further upgrade as storms approach or if severe weather reports begin coming in. When used: If a SEVERE THUNDERSTORM WARNING and/or FLASH FLOOD WARNING has been issued for your county. Priority must be given to collecting and relaying weather reports. Net Contol will announce warning information frequently. Only reports meeting the criteria mentioned earlier should be requested. “It’s not raining here” reports are not needed, unless requested. When used: If a TORNADO WARNING has been issued for your county. Net Control Station takes total control of frequency. Net Control requests tornado, funnel cloud and wall cloud reports. If there are no tornadic reports, Net Contol requests reports meeting the above criteria. Stations without one of the above reports should maintain radio silence. Net control will relay Tornado Warning information frequently. Condition RED events are rare. However, real emergency organization in these instances is what will make the NWS, trained spotters and all licensed amateurs involved with ARES fulfill their missions and shine. Often, if one waits until a warning is issued, it is too late to organize spotters, collect reports and relay them to the NWS in a timely manner. Spotters are also requested to check-in/check-out in Stand-by and Condition Green, when possible. This will help net control know where available spotters are before the storm moves through the county. 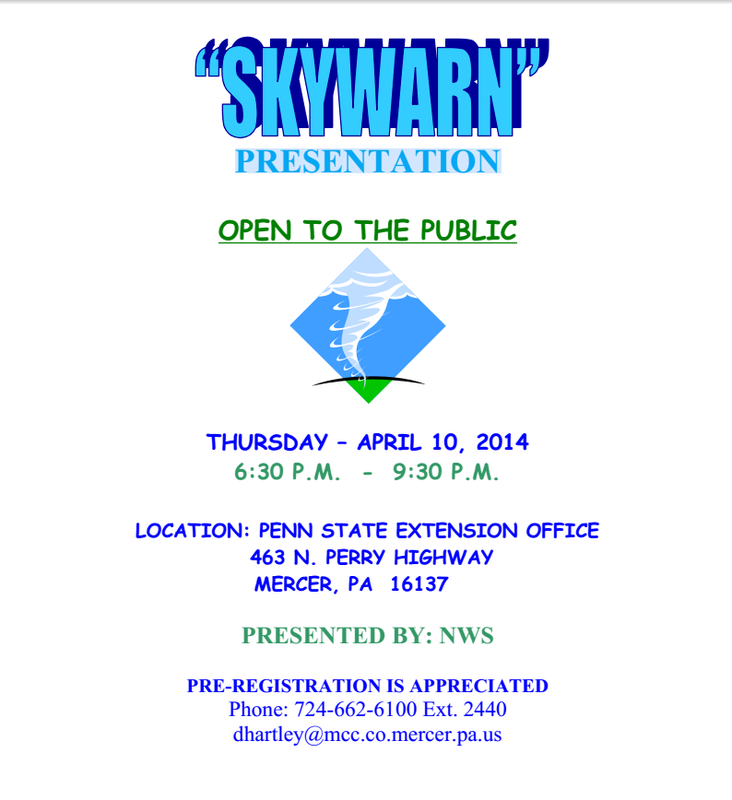 Let’s all work together to make a great and informative SKYWARN program here in Mercer County. Thanks in advance for your contribution! QST – Beginning Thursday, July 11 at 8:30pm, the Mercer County Emergency Communications Net will begin monthly nets immediately preceding the Thursday Night Soapbox net on the W3LIF repeater (145.350 -). The purpose of the net shall be to provide training in emergency net procedures, testing emergency communications equipment, and relaying general traffic that pertains to Mercer County ARES and RACES. This net will meet regularly on the first Thursday of each month. This will be a directed net handled by an ARES net control operator. If you are interested in becoming a net control operator, please see this post. We hope that you will join us for this opportunity to gain training in emergency net procedures! Net control operators are needed for the Mercer County Emergency Communications Net as well as the Mercer County Skywarn Net. If you have a desire to act as a net control station and have a station with solid access to the W3LIF repeater and can possibly work simplex as well, we could use your help! The goal is to get a roster of net control operators to be available during sever weather, emergencies, and our Emergency Communications training nets. You do not need to have previous net control experience if you would like to help…training will be provided.